A Corinth, Mississippi, family finds a formula for success that has lasted for four generations. Kenneth Williams smiled as he stood before the 50 or so friends and colleagues seated in a pavilion under the pines on a pleasantly cool morning in northeast Mississippi. Calling the assembly to order, he looked like a preacher clearing his throat before the invocation. Even the surrounding choir of crickets suspended its chatter as he spoke. “On behalf of my family, it’s a real joy to welcome you to this annual gathering,” he said, genuine warmth in his voice. Wasting neither time nor words, he moved to the back of the pavilion, detached but fully engaged as two sons and a nephew took over the meeting, just as they one day will take over the family business. For half a century, the Williams clan of Corinth has welcomed their guests as family under the Mississippi pines near a spring-fed lake called Waukomis, which means “clear water” or “cool place to drink,” an appropriate setting for people who sell Coca-Cola. Coke is the most famous brand in the world, but its roots are decidedly Southern. So, too, are those of the Coke bottlers who come to this corner of Mississippi each year to replenish a treasury of memories and share stories of successes and near misses. They are, indeed, a Southern family, bonded by shared aspirations for the communities they serve. For the hosts — the Weaver-Williams family that owns the Corinth Coca-Cola Bottling Group — time is measured in generations. Kenneth and his older brother Sandy are the family’s third generation in a business begun by their grandfather in 1907. Each year for more than 50 years, along with the already-in-place fourth generation, they invite bottlers from across the South to the pavilion in the woods. This year, their definition of “south” stretched from south Florida to South Dakota. At this annual gathering, you might expect the discussions to focus on how much Coca-Cola or any of the company's hundreds of other drinks are being sold, but just as many of the discussions are about community service. The fellowship feels more congregational than corporate. And a commitment to serve the community and the company’s employees is anything but old-fashioned here. Just as the enduring formula for Coca-Cola has touched three centuries, the communal formula of success for these independent bottlers gathered under the Appalachian pines has endured for more than five decades: Work hard, help your neighbors, trust each other. Corinth is not what a stranger envisions for Mississippi. It resembles neighboring Appalachia more than it does the Delta to the west. All that began to change in 1934 when the Tennessee Valley Authority built Pickwick Dam, an electric-power and flood-control project that provided the means to modernize. Today, the area’s economy is strong, with employers including Corinth Coke, Packaging Corporation of America, Caterpillar, and Kimberly-Clark. “We began to prosper because we have always had people willing to put in a good day’s work for a good day’s pay,” Kenneth says. But to the Williams family, rooted in a sense of stewardship on behalf of the people of Corinth, success is not measured only by the bottom line. The evidence is everywhere. There is hardly a church, service club, or charitable activity in town that isn’t laden with Corinth Coke volunteers. You would expect civic service from one of the town’s earliest employers, but you might not expect the depth of commitment that comes with it. The sense of obligation is to more than local institutions and causes; it’s also to the betterment of friends and neighbors. The resolve comes from the man at the top, whose personal passion is running. Even when he’s standing still, the lean, fit, and tall Kenneth Williams looks like the distance runner he is. He’s run 65 marathons, including the 2013 Boston Marathon, where he was three-quarters of a mile from the finish line when the first bomb went off. Ten years ago, Kenneth served on the Mississippi governor’s Fitness Council, and when a school in nearby Iuka was selected to receive an award, he was asked to “run it up there.” So he did, literally, run the 22 miles to the school. One of the students inspired by his effort that day went on to become a state-champion runner before he graduated from high school this year. At the center of Williams' commitment to community is his company’s annual Corinth Coca-Cola 10K, a hometown race that draws 1,500 runners a year. Many local families invite relatives and friends for what has grown to be a weekend of community events. One fan told Kenneth that her two favorite holidays are Christmas and the Corinth bottler's 10K. Not surprisingly, the 10K in Corinth is a bit different from any of the other 4,200 10K races in the U.S. each year. Two and three generations of local families enter the race or serve as volunteers. Prizes reward extraordinary achievement. One year, a local was cited for competing as part of his recovery from a stroke. Fittingly, the award winners are nominated by their neighbors. One man — a former Corinth Coke employee who’s now a Corinth police officer — has run all 36 races, which offer cash prizes in male and female age categories up to 80 and older. Somehow each year, there is always an oversupply of commemorative T-shirts to ensure that the leftovers can be shared with mission workers and local armed-services units stationed overseas. One soldier who received a shirt while serving in Iraq returned a few years later to run the race. The Coca-Cola story begins in 1886 when Columbus, Georgia, pharmacist John Pemberton mixed a batch of syrup in his backyard and sold some to an Atlanta pharmacy. The flavored soda water was a big hit with customers, including businessman Asa Candler, who bought the patent. Soon Joseph Biedenharn, a Vicksburg, Mississippi, candy store owner, started putting it in bottles, thus forging one of the earliest links between The Coca-Cola Company in Atlanta and its locally owned bottlers around the South. Another link was added by two Chattanoogans, who asked Candler for the exclusive rights to put Coke in bottles. Candler sold that right for $1, but wisely, he kept the formula to himself. It wasn’t long after this that two Mississippians –– A.K. Weaver and C.C. Clark –– partnered on a shared interest in the Corinth Bottling Works, a tiny soda-water plant in a town that then numbered nearly 4,000 people. Their objective was to secure a Coca-Cola franchise for northeast Mississippi, but when Clark was granted a license for New Albany, Mississippi, he moved there in 1906. Now the Clark Beverage Group is based in Starkville, Mississippi, and employs more than 1,200 people, including third, fourth, and fifth generations of the Clark family. In 1907, A.K. 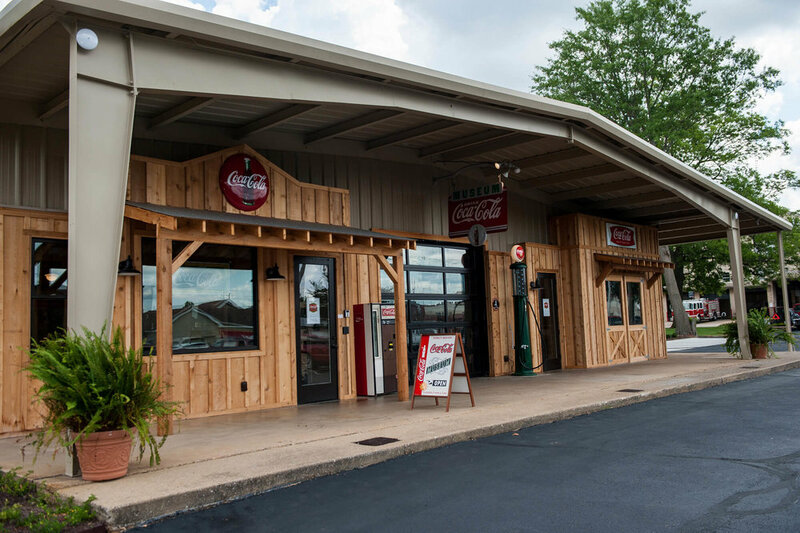 Weaver — Kenneth and Sandy’s grandfather — created the foundation for his own family bottling business by forming a partnership to begin bottling the soda shipped in by rail from Jackson, Tennessee. Today, Corinth Coke’s more than 300 employees are spread from the Tennessee River to the Mississippi River, and soon will cross the river into Arkansas and Missouri. A handful of loyal employees and an enduring faith in progress kept A.K. Weaver afloat in those early years. It was hard work. Bottles were washed and filled by hand and capped with a foot-powered machine. Rural deliveries were made by rail. In Corinth the local delivery system was simple but effective — one man with a wheelbarrow crisscrossing the town. Horse-drawn carriages and gasoline-operated trucks came later. As the 20th century rolled on, new equipment would be installed, new buildings constructed and new generations of family talent recruited into the business. From the beginning, family bottlers had a unique relationship within The Coca-Cola Company. For more than a century, the descendants of A.K. Weaver, like many other families around the country, have been the local faces of Coca-Cola — selling and distributing (though, in their case, but no longer actually bottling) a growing array of products. Kenneth’s older brother Sandy recalls that he and Kenneth began working in the family business sweeping loading docks, unloading boxcars, sorting bottles, filling cardboard cartons, and loading trucks. Too small for the standard Coke uniforms, the boys needed a family friend to tailor the official uniform down to size. In 1958, after graduating from Ole Miss and finishing a stint in the Army, Sandy joined Corinth Coke. “They paid me $60 a week, but offered no specific instructions, so I started riding with the route drivers to learn the business,” he says. Sandy had a flair for sales, which he directed until he became general manager at age 32. He is now the chairman of the board. The family’s fourth generation now holds leadership positions. At Corinth Coke, Kenneth’s son Ken is vice president and chief operating officer, and son Martin is vice president and chief financial officer. Sandy’s son Lee Williams is vice president for Refreshments Inc., a sister company managing the vending and foodservice group. Like their fathers, all three started on the loading docks and at the recycling center. And having a presence means being active in community institutions, including churches. In many Southern Christian churches, stewardship is the belief that people should actively take care of the world around them. Sermons on stewardship are typically heard every year during annual tithing campaigns. To churchgoers like the Williams family, stewardship is an idea that reaches far beyond the sanctuary. When Kenneth talks about providing good jobs in Corinth, he’s acting out his sense of stewardship. When Sandy and his wife Rosemary work tirelessly to preserve the history of the company and community, they are expressing their sense of stewardship. As a result of that commitment, the Williams family has come to represent something more than a corporate franchise. Across four generations, the family’s community responsibilities have been as important as its corporate functions. Both endeavors have been remarkably successful. And they don’t take success for granted. All the family members in the business cite the “shirtsleeves-to-shirtsleeves” metaphor: Some family businesses do well as the first generation works in shirtsleeves. In the second generation, however, success is assumed. This generation works in coats and ties, yet effort is scaled back and the business falters, bringing the third generation back to shirtsleeves. That’s the case for Charles Taylor, executive vice president for Corinth Coke, and his family. He’s worked there for 47 years, in jobs that range from delivery truck driver to corporate sales and general manager of the Lexington, Tennessee, operation — a position now held by his son Rick Taylor. Charles’ dad started at Corinth Coke in the late 1940s, and since then three generations have worked for the company, including uncles, brothers-in-law, nephews and more. Stories abound about the family’s commitment to its team members and community. There’s the time Sandy drove Charles’ father to the hospital in Memphis to get the additional care needed after a severe reaction to an antibiotic. And the series of planning sessions in the family’s basement to help create an historical interpretive center now visited by thousands each year. The annual Coca-Cola bottler gathering at Waukomis is an oddity among modern corporate management systems usually dominated by top-down, command-and-control cultures. At Coca-Cola, the bottlers have always had key roles in marketing and distribution. They know what sells and how to sell it. So The Coca-Cola Company itself sends its people to the gathering under the pines to listen and learn. April Conrad, a Coca-Cola franchise manager, is the granddaughter of a Mississippi pharmacist. Her first exposure to Coke was at the family soda fountain. In an era that has seen the displacement of locally owned businesses like banks, main street clothing stores, and mom-and-pop drug stores, Coca-Cola bottlers have survived because of their determination to tenaciously plant and cultivate community roots. And now, as the company returns its franchises to local partners like the Williamses, those local bottlers are growing beyond their original borders. Every Wednesday at the spring-fed Waukomis Lake, the site of the annual gathering, the family opens the gates to let locals take home as many gallons of spring water as they like. Cars line the road as people share in the bounty. Many believe the water has medicinal properties. Could be, but the family, stewards of the spring, believe the blessing comes in the sharing.